There’s a lot to be thankful for this holiday season for much of America. 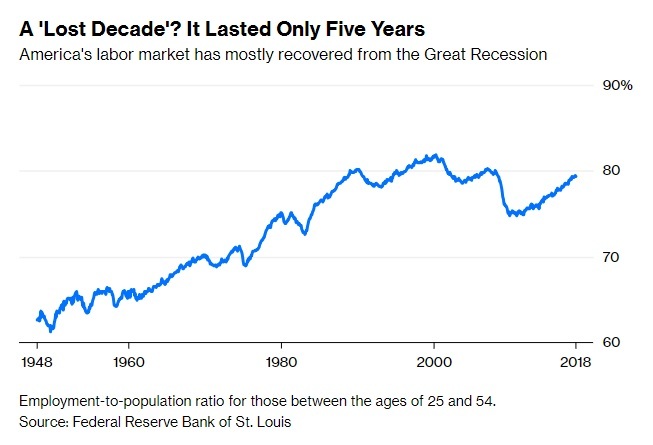 Unemployment has reached lows we haven’t seen for nearly 50 years, wages are rising and the U.S. labor market lost only about five years after the Great Recession compared to other countries that generally lose a full decade. Some of the recovery is because of natural economic forces, but who is ultimately to thank? Supporters of President Donald Trump will say his economic policies like the Tax Cuts and Jobs Act along with massive deregulation are deserving of thanks. How about President Barack Obama, who oversaw the recovery’s start and passed the American Recovery and Reinvestment Act of 2009, providing major fiscal stimulus. Not so fast on either, Bloomberg’s Nolan Smith says in a recent opinion piece. Supporters of President Donald Trump, of course, would like to think that he’s responsible. But the evidence for that is pretty slim. Yes, Trump signed a large tax cut in late 2017. Tax cuts can make an economy more efficient, as well as provide some Keynesian fiscal stimulus. Yet analysis shows no correlation between how big of a tax cut an industry got, and how much it boosted hiring and wages. That means that the tax cut has probably only been incidental to the health of the labor market. Meanwhile, Trump’s trade war is unlikely to help U.S. businesses. There is at least one way Trump could be helping the economy: emotionally. Business sentiment boomed when Trump was elected, possibly as a result of perceptions that Trump is pro-business. Confident businesses tend to invest more. There is a danger that the confidence is unfounded. But for now, it could be adding a tailwind to investment. Obama fought hard to pass the American Recovery and Reinvestment Act of 2009, which provided a major fiscal stimulus. The most important thing that stimulus did was provide money to cash-strapped state governments. That helped states bound by balanced-budget laws keep government workers on the payroll; had those workers been forced into the ranks of the unemployed, the recession would have been worse. European countries that responded to the crisis with austerity measures learned this lesson the hard way. 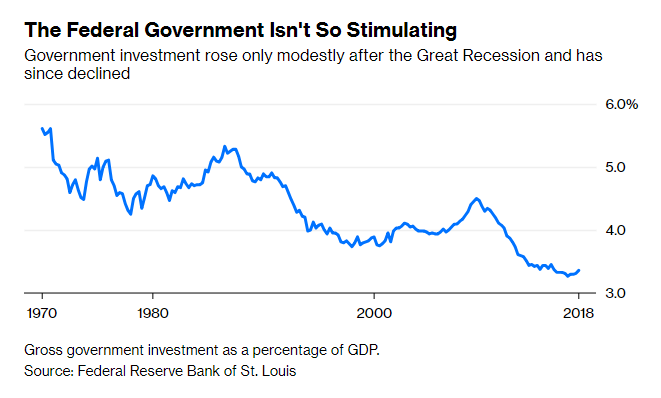 And although Obama’s stimulus helped prevent the Great Recession from becoming a slightly greater recession, its effect was spent by the time the recovery really took off. To his credit, Obama refrained from making the economy even worse. By the same token, the credit he gets for the good economic performance since 2014 should also be modest. The real hero of the story is probably the Federal Reserve. When the crisis hit, Chairman Ben Bernanke didn’t hesitate. Motivated by his own research on the financial roots of recessions, he abandoned the Fed’s traditional cautious approach. He dropped interest rates to just about zero immediately. He helped save the banking system, using unconventional monetary policy to take huge amounts of toxic mortgage-backed assets off of banks’ balance sheets — assets that eventually turned a profit for the taxpayer. But unlike fiscal policy, monetary policy didn’t let up. Despite frantic calls to raise rates to avoid creating inflation or financial instability — neither of which materialized — the Fed stayed the course, keeping rates at zero until late 2015 when it became clear a real recovery was underway. It also engaged in repeated rounds of quantitative easing, again in defiance of the skeptics; some of this probably did have the effect of boosting lending and the real economy. So if you want someone to thank for America’s early exit from the economic hole it dug itself into in the 2000s, thank the Fed. Thank Ben Bernanke for swift and decisive action, and thank his successors, Janet Yellen and Jerome Powell, for maintaining a steady course. Without them, the U.S. might still be mired in a lost decade.